"I was asked to be at the retirement dinner for a Perry Police Officer who is retiring after 40 years of service. That seem like such a long time until I realized that when we came with the police department, he had only been there 27 years. He was the first black officer that was ever hired. He and his wife became dear friends to us. Judging from the turnout of nearly 200 people, I'm sure he was a friend to many. The City Council, the Mayor, the County Commissioners, the Perry Police Chief and the past Chief, the Houston County Sheriff, many officers, deputies, state patrol and firefighters were all there. I think that most everyone was especially kind to me because of the passing of my wife Marie. Both the former Chief of Police and the Sheriff spent a good deal of time with me. I was blessed to have had all the wonderful and amusing stories about my friend. During the brief time of three years that we were with the police department we saw a mini revival. One of our officers, who was shot in a shootout accepted Christ as his Savior. We had little to do with this except to encourage him to start reading his Bible. Both his wife and his sister-in-law had been praying for him for years. Two Christian Officers really started living for the Lord. A female officer really started living for the Lord. A female officer left the department in order to go to Bible College. Two other officers decided to leave so that they could spend more time with their families and be in church every Sunday. We were thrilled but I don't think the Chief was very happy. He usually was not at the roll call but he came in just in time to hear another officer say, "I'm leaving." When someone asked what are you going to do, he said, "Preach." The Chief gave me a strange look. The officer, a Christian was just joking. He needed more time for his business. A couple was there yesterday but I did not recognize them. They seem to know all of the other officers and their wives. The officer that was joking about preaching had changed in the last 10 years and had a handlebar mustache and I did not recognize him. In fact, I have not laughed so much since Marie went into the hospital. Thanks to many of you who knew I was discouraged and needed encouragement." 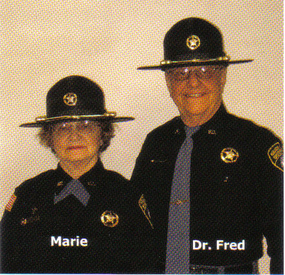 Please pray for Chaplain Henzler due to the fact his wife Marie went home to be with the Lord recently! Posted on February 9, 2014 by Bob & Jane Keller and filed under Blog Updates and tagged chaplain Fred Henzler.